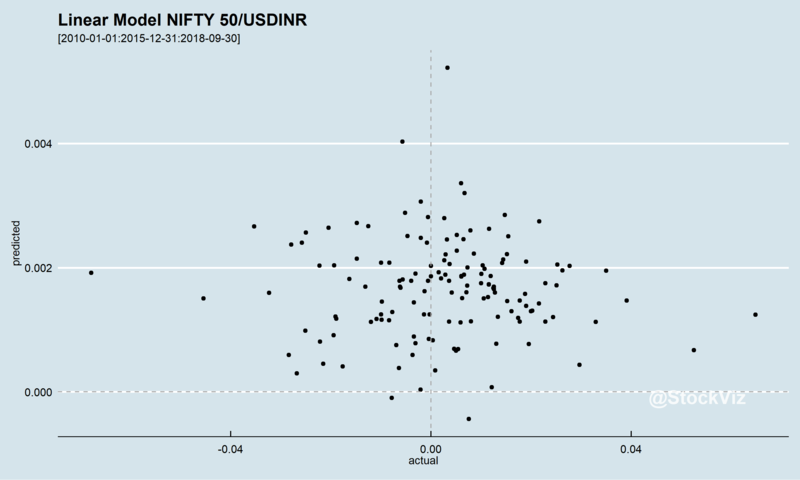 Our correlation study showed a -0.54 between NIFTY 50 and USDINR whereas a 0.21 with OIL. Here, we will use weekly returns of the NIFTY and USDINR to build a simple linear model. Ideally, the ‘Residuals vs. Fitted’ plot should show residuals evenly distributed around the zero line – it doesn’t. The Q-Q plot should lie on the diagonal – it is marred by heavy tails. Hence, we should scale-down our expectations from the model. For this post, we will split the time-series that we have into a “training set” that goes from 2010-01-01 to 2015-12-31 and a “test set” that goes from 2016-01-01 to 2018-09-30. We will build the model with the former and test it with the latter. 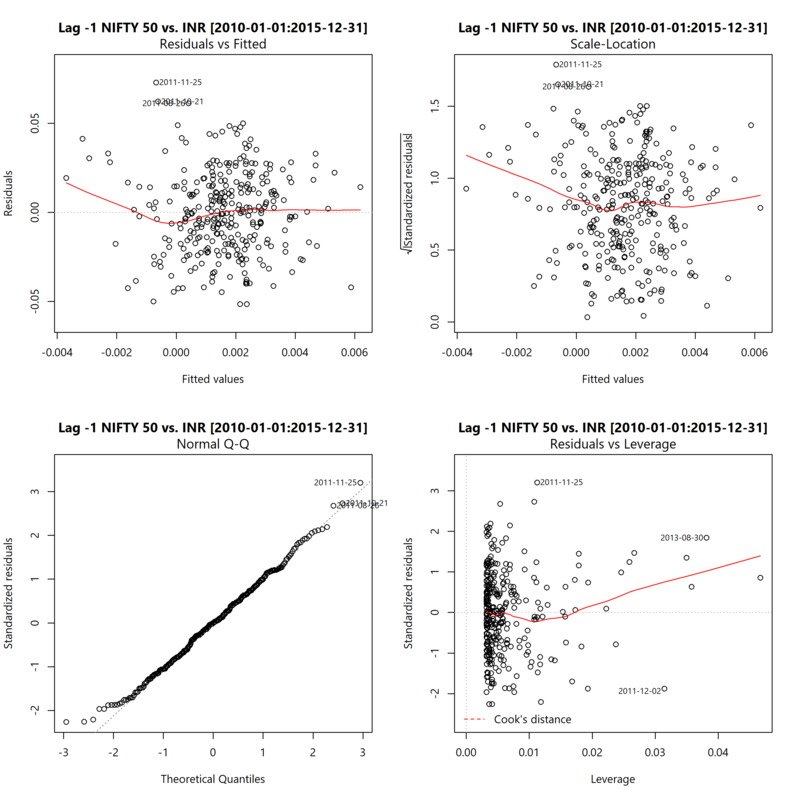 To test our model, we will give it the actual NIFTY 50 returns (x-axis) and plot the predict NIFTY 50 returns (y-axis.) The problem here is immediately apparent: it is heavily bullish! It consistently gives a positive prediction. 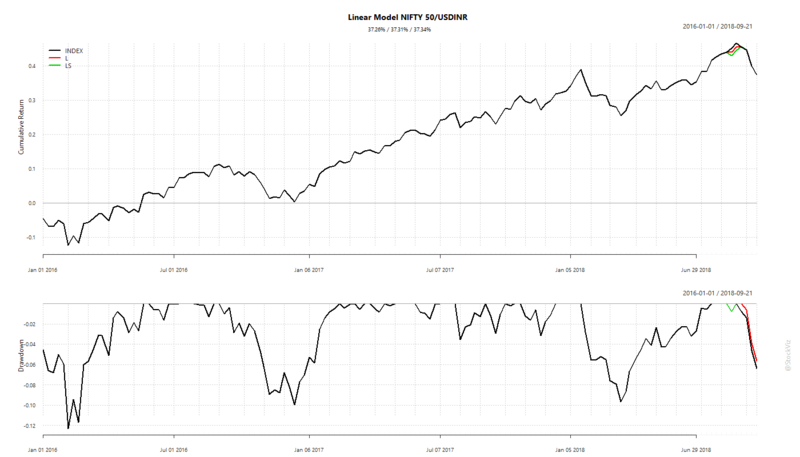 A weak correlation between NIFTY 50 and USDINR is not much to work with and a linear model built over that relationship is no better than buy-and-hold. Given the narrative spun by the media, it is tough to wrap ones head around the results above. We conclude with density charts of weekly NIFTY returns under different USDINR return thresholds in Part III.